Meet Kacy! 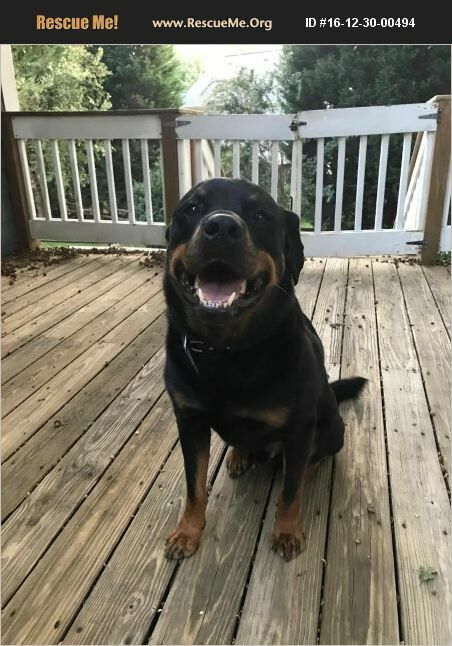 He is a sweet 5 year old Rottie boy that is looking for a loving home. Kacy is an energetic, fun loving, goofball. He loves the water and it's not uncommon for him to jump right in the shower or the tub with you. He is living with 2 Rottie females and 2 kids (ages 5 &7) at his Foster home. He loves to go on walks and play with the kids. He's also a big fan of just chilling and getting snuggles. He is very food motivated and is really good at basic commands; SIT, DOWN, ROLL OVER, STAY, COME. He has had some training and is very eager to please. He doesn't care about other dogs and would probably be just as happy as an only dog. He doesn't really know how to play with other dogs and he is kind of LOUD and vocal when he does, so most dogs just walk away from him. Kacy is not interested in cats, rabbits, or squirrels. He hardly even turns his head to look at them when they run across the road in front of him on walks. Kacy will require a very experienced Rottweiler owner. He can be stubborn and pushy at times. He is also known to push his limits a bit. Kacy is EXTREMELY protective of his two human Foster sisters. When he is outside with them or out walking with them he takes his job as protector VERY seriously. He is an all-around good dog and is not afraid of men. If Kacy sounds like the dog you are looking for please contact his foster family and they will be happy to give you more detailed information on Kacy.